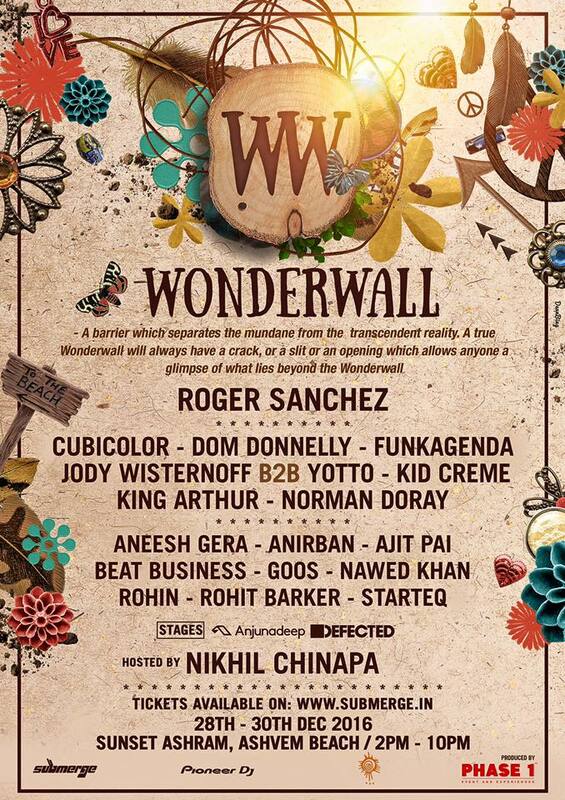 Line up for Nikhil Chinapa hosted Wonderwall Goa festival is out! The limelights’ back in Goa, as Nikhil Chinapa headed Submerge has announced the line up for the limited capacity electronic dance music festival, Wonderwall happening in Goa from 28th to 30th of December. The main notion behind this new venture is to deliver a clean and relaxing music experience to the fans, just like how Goa used to be before. Described as a boutique festival, Wonderwall has a limit of just 1200 people and is not expected to have any blingy LED screens and fireworks, rather, it’s going to have hand painted artwork and signs and hammocks for people to relax alongside the glimmering sands of Ashwem Beach. The festival aims to recognise the efforts of the dance music scene in India which helped in making the country a new hub for all the producers. With a carefully curated and well rounded lineup, Wonderwall promises a wholesome music experience to every one.Playing tunes at the festival are American house music producer King Arthur, whose debut album has got some great reviews. Accompanying him are House heavyweight Norman Doray and Bangalore based Rohit Barker. The full lineup can be found below. Day 2 features surprises, like a curated lineup by Anjunadeep that includes non stop music from the quickly rising star from Finland, Yotto and British favourite Jody Wisternoff. Apart from them, Grammy award winning house producer Roger Sanchez will spin some tunes alongside the Dutch duo, Cubicolor. WonderWall also features Brussels-based house music producer Kid Crème alongside British producer Funkagenda. Indian names are also prominent at the new festival as Nawed Khan and Aneesh Gera will play alongside heavyweights. The venue is Sunset Ashram on Ashwem Beach in Goa, and it is stunning! With a cap of 1200 people,Wonderwall, definitely gives people a chance to end their year, the way the want. The festival is going to be one of a kind, which means that you need to grab the early bird season tickets priced at 3375 INR right away and drive straight to Sunset Ashram at the end of this month! Next article Sunburn Hills Full Lineup Announced – What are your views? Celebrate summer with Parklife 2017!